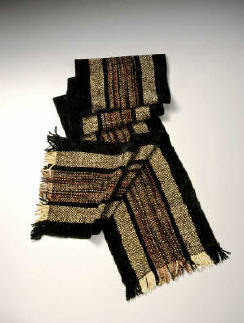 Marla’s creations include handwoven scarves of rayon chenille, cotton and wool. 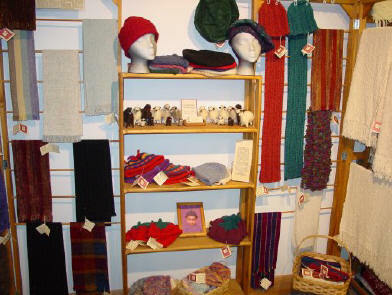 Her selections also include a variety of hand knitted hats and ear warmers. 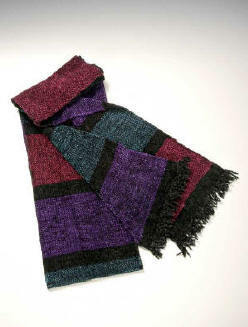 The vibrant colors of Marla’s chenille scarves and shawls have become her signature in the weaving world. A native of the Chicago area, Marla holds a BS Degree from Southern Illinois University in Elementary Education with a minor in Art Education, and is a certified fiber arts educator. 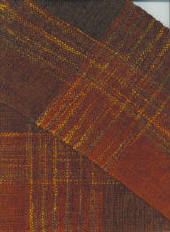 Marla moved to Charleston, Illinois in 1976 and learned to spin and weave through the local weaving guild. Marla owned her own yarn shop in Charleston for several years. 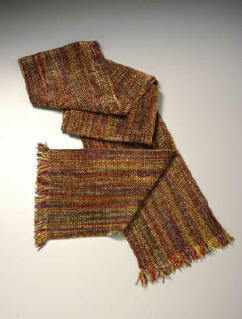 She continues to attend weaving and knitting workshops, and teaches knitting classes at Yarns Unlimited in Bloomington. Marla also participates in area Art Fairs such as the Madison Chautauqua and the Brown County Winter Art and Craft Fair at the Seasons Lodge in Nashville. 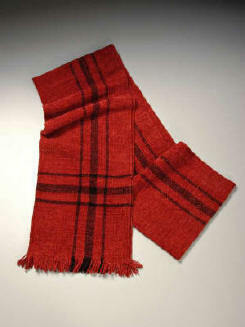 Besides the Brown County Craft Gallery, where Marla is manager, she is a member of the Brown County Craft Guild and Bloomington Spinners and Weavers Guild,. Marla, her husband Ron, and son Scott live in Ellettsville, Indiana.